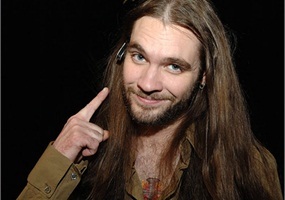 American Idol alum Bo Bice, the rock singer who lost to country star Carrie Underwood in Season 4, no longer has long silken hair — but he does have a tale to share about an experience at an airport Popeye's that recently moved him to tears on the evening news. His anger isn't over, say, indigestion from a succulent piece of Popeye's mild Louisiana Tenders™, but rather the perceived "reverse racism" Bice claims he experienced. "I'm not a bigot," Bice stated into the camera at the top of Fox 5 Atlanta's report, which feels like a defensive stance to open with. "I love everyone." Which is why, the Idol also-ran says, he was so leveled by the words he heard at the Hartsfield–Jackson Atlanta International Airport Popeye's on that fateful day. Those words? "White boy." "One of the three young ladies behind the corner said, 'he already got his, that white boy over there," Bice recounted to Fox 5 Atlanta. In a much more sarcastic social media post, Bice also claimed that the employee mocked his name "for five minutes straight" by calling him "Bow-Bow," "Boo-Boo" "Bo-Bo," and Bice shared the employee's name and a photo he took of the workers. Bice also took a jab at their serving competence, wrote that the worker used what he felt to be a "condescending tone" with him, and claimed she and the other two women working "all had a good laugh over it." Bice didn't get the apology he wanted from Popeye's corporate in a timely fashion. So, like many Americans who didn't receive the customer service they've come to expect from an airport fast food chain or otherwise, he aired his grievances on social media. But when his original Facebook post was removed for a violation of Facebook Community Standards (likely due to the photograph and personal information shared in it), Bice came out swinging in a followup. "Facebook deleted my post last night and in turn silenced the opinion of all of you and me who are tired of the racist double standards that have infested our society," Bice wrote on January 2. "All I wanted was an apology... Now, Popeyes's will be hearing from my attorney, and to all you FB fans of mine, I'll be deleting this communist media platform from my devices and life." "If the tables had been turned, and I had used something, and been as...insensitive as to say something like that, you're talkin' about that I would be boycotted, people would be not buying my albums, there would be people coming and picketing my shows and everything else," Bice told Fox. It could also be argued that the tables are turned on plenty of non-famous nonwhite people every day, but they don't have the privilege of a large social following to earn them a sympathetic piece on the evening news. Mack II, the owners of the Atlanta airport Popeye's franchise, released a statement of apology for "any pain or embarrassment Mr. Bice may have experienced," saying "the company does not condone the behavior of one of our associates and we took corrective action as soon as we were made aware of the incident." Bo Bice then began to cry on the news segment, marveling at how hard it was to get the respect he feels he deserves from Popeye's (and, as a result, to get some disciplinary action taken against a minimum-wage fast food employee). "The fact that I've got to sit here on TV, come down a notch and look like a petty little brat by tweeting and Facebooking this just to open up dialogue so we can have an adult conversation is ridiculous," Bice said as tears streamed down his face. "And America, you should be ashamed," Bice said, shaking his finger at the camera. Watch Bo Bice recount his Popeye's encounter below.